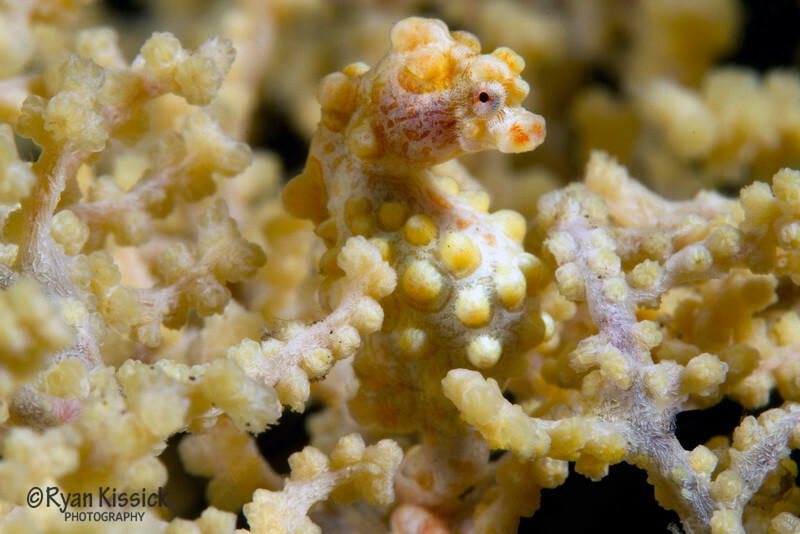 This pygmy seahorse was photographed in September 2014. At a dive site just minutes from Scuba Seraya in Bali, we came across a giant yellow gorgonian (sea fan) in about 80 feet of water. With the help of my dive guide Wix, I noticed 3 pygmy seahorses nestled tightly in the gorgonian's branches. Taking a photo of this funny little fish was no easy feat. For starters, this pygmy seahorse was about the size of my pinky fingernail. Finding such a small creature through my viewfinder was quite challenging. On top of that, I had to contend with a current. While gentle enough to not be dangerous, the current was strong enough to make photographing this seahorse quite an adventure. However, after a few tries, I was able to take this photo with the seahorse staring right at the camera. I feel extremely lucky to have seen this unique creature and captured this moment. I hope you enjoy it as much as I do!